Samsung Electronics (005930 KS) met our rally target outlined in 28 January insight SEC and SK Hynix Breakouts at 70.3k. In that insight we outlined the tactical rise would give way to a pullback toward ideal pocket support that would offer a better risk to reward intermediate entry point for SEC. Multiple rejection at that 47.2-5k barrier call for fresh lows toward preferred pocket and buy support. Only external pressures would adjust our downside bias to lower pattern support that comes in at 35k. 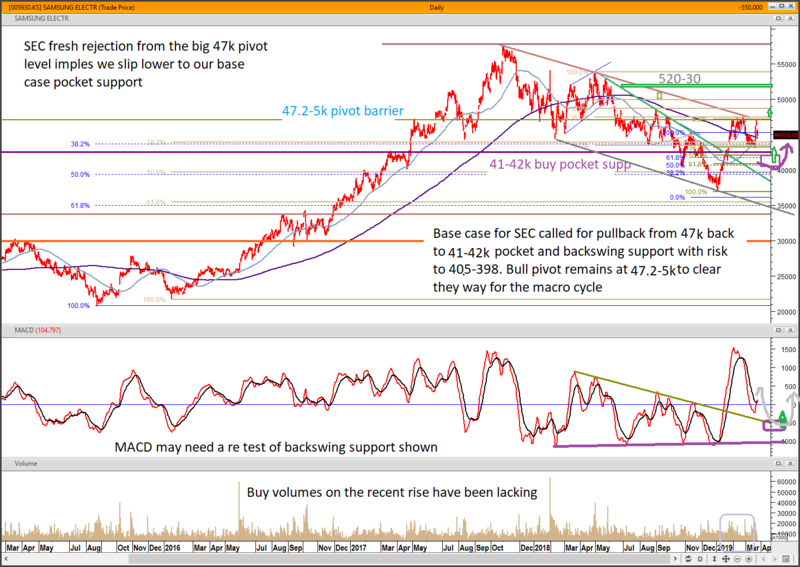 MACD basing support is expected to create a solid support for price on weakness. Risk lies with the MACD slipping back within the pattern range. Relative strength for the PHLX Semiconductor index began a bottoming process in November of 2018. In mid-December. Since then we have expanded our recommendations substantially and upgraded Technology to overweight in late-January. Despite four months of outperformance, we believe the move for semis is just beginning. In today’s report we highlight our favorite technical setups, including: AMAT, MRVL, AMBA, STM, ON, MU, NVDA, SWKS, MCHP, TXN, AVGO, LRCX, NXPI, ASML, TER, MKSI, ICHR, ACLS, and TSEM. The MSCI ACWI ex-U.S. is breaking topside its nearly 14-month downtrend and above key resistance. The move is being fueled by improvements throughout most of Europe and the UK, along with strength in China over the past 2-3 months. We believe these positive developments are supportive of higher equity prices moving forward. We provide a technical appraisal of all major markets. The STOXX 600 Banks and Insurance Sectors are exhibiting bullish price inflections and RS indicates these areas may be emerging as leadership. In today’s report we highlight actionable stocks throughout the int’l Financial Sector. The S&P 500 is working through 2,817 resistance and our technical work continues to support an overall positive outlook. As markets improve in Europe and in EM countries, U.S. markets in turn should get a tailwind of improved global equity market conditions. In today’s report we highlight attractive Groups and stocks within Technology: Large- and Mid-Cap Semiconductors Large/Mid-Cap Semi Equip. (TE-04), Software, Enterprise Applications (TE-42), and Software, Design Solutions (TE-46). List of charts included: Intel Corp (INTC US) $TSM, Texas Instruments (TXN US), Analog Devices (ADI US) Xilinx Inc (XLNX US) Advanced Micro Devices (AMD US) Microchip Technology (MCHP US) Skyworks Solutions (SWKS US) Marvell Technology Group Ltd (MRVL US) On Semiconductor (ON US) Monolithic Power Systems, Inc (MPWR US) ASML Holding NV (ASML NA) , Applied Materials (AMAT US)Lam Research (LRCX US) Teradyne Inc (TER US)Mks Instruments (MKSI US)Microsoft Corp (MSFT US)Oracle Corp (ORCL US)Sap Se Sponsored Adr (SAP US)Now Inc (DNOW US)Workday Inc Class A (WDAY US) . Resona Holdings (8308 JP) key tactical resistance lies at 503.86, a level that if broken could spur a counter trend tactical bounce back to outlined trendline and physical resistance. The daily cycle does show some underlying tactical support given the RSI has not confirmed recent lows. Any rally would be a counter trend move within the larger degree decline cycle. Buy volumes are not supportive in this rise (deteriorating) underscore the macro bear posture. If the weekly cycle head and shoulders is true to course, Resona Holdings would face significant downside pressure looking ahead 2 quarters.